If your students are like mine, about this time of year they are showing signs of Calculus Burnout. You’ve got to finish your unit on volumes and everyone is confused. The textbook you are using includes the most detailed and lengthy explanations for arriving at the symbolic formulas for finding volumes of a wide variety of solids. Your students stare at you in disbelief that they must memorize more formulas! Seriously, their brain is full, or so they think! 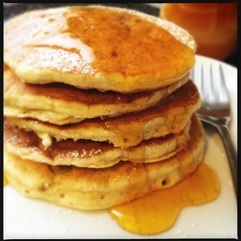 then I like to use the books versus pancakes approach! This approach has helped to calm the fear and intimidation of this last important topic to success in AP Calculus. What are you stacking? 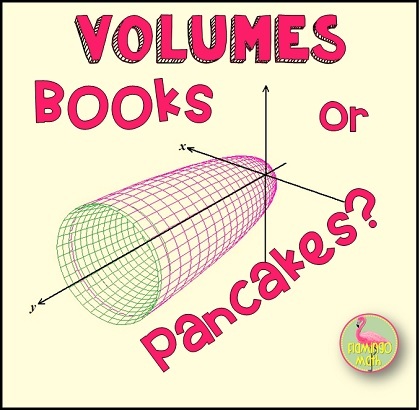 Books or Pancakes? Sketch the region to be revolved, in two-dimensions. Find the points of intersection. Know whether the axis of rotation is vertical or horizontal. With those items out of the way, we are ready to explore the two types of slices of our Riemann Sums! This is where the idea of lining up books on a bookshelf or stacking pancakes comes from. After that fact is determined, students should feel ready to tackle the mathematics. On a side note, students often have trouble deciding if the volume is a disk or a washer. How do you write the integrals when the region to be revolved creates a washer? My Calculus hero, Lin McMullin, has insight about this topic on his blog at Teaching Calculus. If you have time, read about how to Subtract the Hole from the Whole. I will make the assumption, in this post, that students are comfortable with identifying a disk method or washer method. Which radius is “Capital R”, and which radius is “Baby r”? This is the next dilemma I hear most often. The problem, students tell me, is how to differentiate between R(x) and r(x) when the axis of rotation is horizontal, or R(y) and r(y) when the axis of rotation is vertical. For example, let’s consider the region with a horizontal axis of rotation. 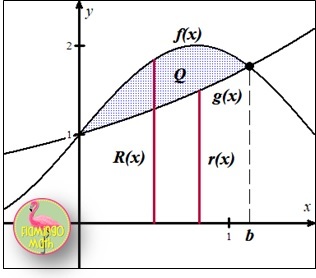 R(x) will be the distance from the curve farthest from the axis (line) of rotation, while r(x) is the distance from the curve closest to that axis (line) of rotation. This line of thinking will also hold true for a vertical axis of rotation. I often hear students use language like “top minus bottom” and “outside minus inside” when they are working cooperatively. This is a washer, because the shaded region does not lie on the x-axis. See the hole? The axis of rotation is horizontal, so we are stacking books on a bookshelf. The slices of the Riemann sum are perpendicular to the axis of revolution. The interval for integration is from 0 to b. My favorite exercise after this lesson is to give students this 8-question practice assignment. The first seven questions use only the parabola y = x2 from x = 0 to x = 2. The last question is a bonus. Students discuss whether the prompt is a disk or washer and whether the Riemann Sums are “Books” or “Pancakes”! I would love to hear your thoughts or feedback! Do you have any tips for helping students master these concepts? Do you want to stay in touch? Be sure to sign up for our newsletter to receive free activities and ideas to help you and your students succeed every day!